The Football Association of Wales (FAW) has confirmed it has submitted a bid for Cardiff to be chosen as one of the host cities for Euro 2020. The FAW hope to secure a package of matches consisting of three group games plus either a last-16 or a quarter-final match at Cardiff's Millennium Stadium. Uefa will announce the 13 host cities in September. The FAW's bid has been backed by Real Madrid winger Gareth Bale. "It would be an unbelievable experience to play in the 2020 European Championship finals in my home city of Cardiff," Bale said. "I have been fortunate to play in some of the world's greatest stadia but nothing matches the atmosphere and passion generated by the Millennium Stadium. "These are exciting times for Welsh football and I'm really proud to offer my full support to the FAW's Uefa Euro 2020 bid." Cardiff will face competition from around 20 cities, with London, Glasgow and Dublin also keen to stage games. The Football Association has submitted a bid for Wembley to host either the semi-finals and final, or some group matches. The Scottish Football Association will submit a case to host three group games and a round-of-16 tie for the 24-team tournament. The FAW's bid has the full support of the Welsh Government, Cardiff Council, the Millennium Stadium, Cardiff and Bristol Airports as well as the key rail and bus operators. "We believe that we have a strong and compelling proposition," FAW chief executive Jonathan Ford said. "In terms of transport, our bid is supported by both Cardiff and Bristol airports who have signed service level agreements outlining their delivery of Uefa's Euro 2020 tournament requirements. 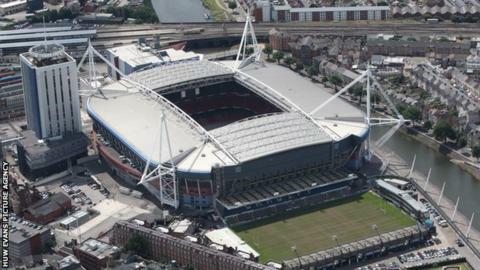 "All Uefa Euro 2020 ticket holders will also benefit from free travel on buses and trains including the transport connections linking Cardiff city centre with both Cardiff and Bristol airports. "We have a strong accommodation plan with the majority of Uefa's own accommodation requirements located within walking distance of the Millennium Stadium." FAW chief Ford hopes Cardiff's bid to be a Euro 2020 host city will be boosted by hosting the Uefa Super Cup - between the winners of the Champions and Europa Leagues - on 12 August at the Cardiff City Stadium. Ford said a successful Cardiff bid would also benefit grassroots football in Wales in the long term. "In order to help ensure a lasting positive impact from hosting this prestigious tournament, the FAW will create a Uefa Euro 2020 Legacy Fund, into which the FAW will reinvest the surplus it generates from staging Uefa Euro 2002," he said. "This legacy fund will be used to support grassroots Welsh football and will have a positive impact on communities throughout Wales."